Lift the burden of garage storage at the flip of a switch! Tired of looking at that old eyesore known as your cluttered garage? Imagine a garage storage solution so simple, that with one flip of a switch your muddled mess of a garage is suddenly free of mayhem. 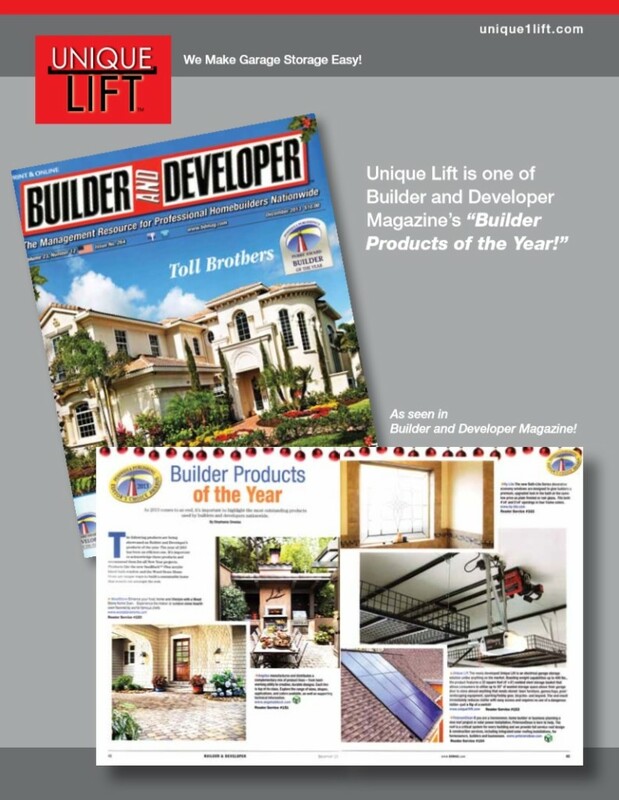 The Unique Lift™ is an innovative garage storage system that takes advantage of the unused space above your garage door to maximize storage without the cumbersome and dangerous use of ladders. Space-saving, and ergonomically engineered, Unique Lift’s concept is actually quite simple. A 32 square foot steel basket is attached to heavy duty steel cables which are driven through a rugged steel gear box by a 1/2 horse power electric motor controlled by a user-friendly master switch box. By simply turning the key to raise or lower the position, then depressing and holding the raise/lower button to your desired position – items are either raised for secure storage above your garage door, or delivered down to your for instant, easy access. Unique Lift™ is the smooth, safe and secure garage storage optimizing system that’s perfect for most anything you have cluttering your garage. Store up to 500 pounds of lawn furniture, pool equipment, landscaping tools, bicycles, sporting and hobby gear and just about anything you can think of in the 30″ (approximately) above your garage door. Load, lift, or lower again and again! Unique Lift™ is also virtually maintenance free, self-lubricating, and comes with a five year limited warranty on parts. Lear more about the specifications of our garage lift here! This entry was posted in Garage Storage Ideas, Unique Lift News. Bookmark the permalink.